Car movies aren't necessarily my thing. I suppose it's because I've never really bought into car culture (either blame my homosexuality or my love for Transformers - take your pick) and so movies like The Fast and the Furious never really grew on me. To be fair, I did enjoy a few of them, but I never really went out of my way to watch them either. This movie came to our attention because of a friend who had seen it and was thoroughly impressed with the full production. And while I don't see the physical appeal in Ryan Gosling all that much, I do acknowledge that he's become quite the respected actor in recent years given the types of projects he takes on and the level of skill he brings to the table. So that's how the movie got added to our "To Watch" list, in a manner of speaking. This was one of those great movie experiences where I walked in knowing little to nothing about the movie and thus walked away being totally surprised by the movie. And while surprise alone is never a guarantee of a movie being good or not, it certainly helps one better appreciate all that went into the production. And man, this was indeed a surprisingly good movie. 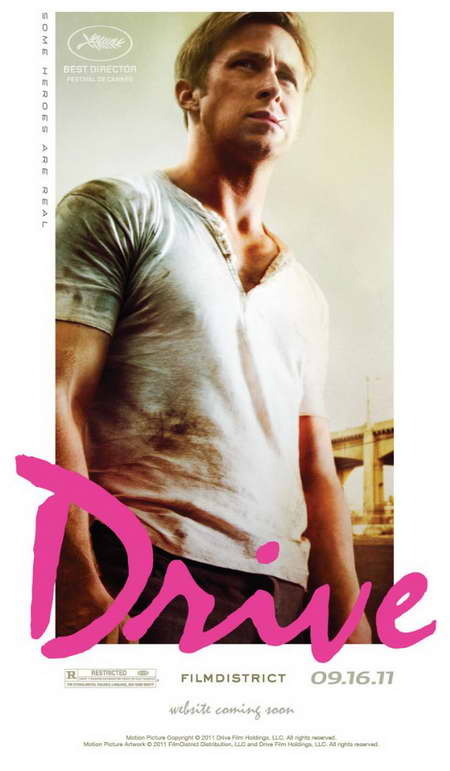 Drive is a 2011 crime drama or perhaps a thriller, depending on your perspective. It was directed by Danish film director Nicolas Winding Refn as based on a James Sallis novel of the same name. The movie won Best Director at the 2011 Cannes Film Festival and also received a standing ovation. The movie begins with our unnamed protagonist, whom we shall refer to as the Driver (Ryan Gosling), performing the role of a wheel man for a heist. He is your cool, calm, collected sort of operator as he handles his vehicle with amazing skill and with a definite plan for escape. In this opening scene, he eventually dodges police pursuit using knowledge of the major public events for the night, which was pretty smart if you ask me. When he's not acting as a getaway driver, he works as a Hollywood stunt driver and sometime mechanic for a man named Shannon (Bryan Cranston). Shannon decides that his skills would best be put to use in the professional racing circuit and convinces local mobster Bernie Rose (Albert Brooks) to lend him money to buy the car in exchange for car being dedicated in his name. And then there's his neighbor Irene (Carey Mulligan) and her son Benicio (Kaden Leos) with whom he eventually gets in closer contact with after she experience car trouble and thus eventually finds herself in Shannon's garage. He eventually spends more and more time with them even after her husband (Oscar Isaac) comes home from prison. And while the husband is doing his best to live a clean life now, his former associates claim he still owes them money and thus the Driver agrees to help him with one last heist in order to get him cleared and thus able to focus on Irene and Benicio. Now at first I was wondering if the movie was going to involve the protagonist being completely silent, since he hardly speaks for the bulk of the movie. While this was not the case, it certainly got me excited about the whole experience since it certainly takes a particular combination of a director and his actors to execute a movie in this manner. And all throughout we had some very meaningful silent scenes, dramatically appropriate long takes and a wonderful use of perspective shots to tell the story. Ryan Gosling and Carey Mulligan definitely made for a wonderful on-screen duo. Both are very intense actors who know how to convey a heck of a lot of emotion in a scene with or without dialog and they really brought that to the fore here. The two had a remarkable on-screen chemistry that helped drive the story along without having the near romance overwhelm the story either. Again, that's not easy to accomplish, but the managed things well enough to keep the story compelling and logical. I was rather surprised by the choice of Albert Brooks as the mob boss, since you have to admit that we know him a lot more for his comedic body of work. But he was a convincing enough somewhat small time mob boss and his scenes did not degenerate into weird black comedy moments either. And to have him working alongside Ron Perlman as his primary business associate certainly helped establish the feel for their dynamic and thus the manner in which their characters operated made sense. The story is quite the amazing one - a solid and tight narrative that translated well into a film production. And the skill of the director was clearly evident given all that he accomplished and only with a $13 million budget, which seems almost surreal for a movie that involves quite a few car stunts. They didn't resort to excessive CGI here (thank the stars for that!) and instead had to have actual stunt drivers manipulating the vehicles, which really added a nice sense of weight and thus reality to the production. Drive is one of the most original movies to come along in a while. You can't even compare this movie to The Fast and the Furious, since that would be a horrible disservice to this production. And heck, not even its mainstream trailer does the actual movie justice - you're so much better off just picking up the movie for yourself and not trying to do more advanced research on it. And thus I have no choice but to rate this movie as a solid 5 moments of the Driver losing his cool and revealing just how much he has bottled up inside out of a possible 5.